We cat lovers know that our feline friends are a huge part of the holidays. Christmas cats on decorative throw pillows make a fun addition to our holidays and remind us that this season is perfect to share with cats. 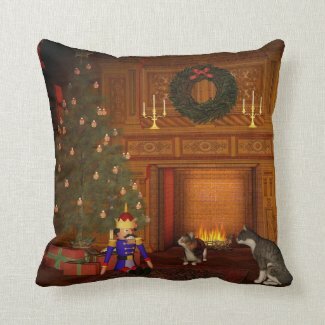 Whether it’s funny, sweet or even vintage, there’s an ideal Christmas cat throw pillow for your home. As a cat lover myself, I love the funny ways that cats sometimes entertain me. They seem to have that perfect sense of dry humor. These are just a few of my favorite funny holiday cat pillows. Throw pillows are the easiest way to decorate for the holidays. I have numerous Christmas pillows that I used throughout the house. Just toss one in the corner of the couch for a quick holiday decor effect. I’ve also put them on side chairs in the kitchen or dining room. Of course, my bed gets several to create a fun Christmas mood. There is something so sweet about cats and Christmas time. Although none of my many cats have ever stood still to have a Santa hat actually put on them, I do know many friends who regularly are able to add Christmas features to their cats. Since I can’t, I use cat Christmas throw pillows instead. Depending on how you decorate for the holidays, you may prefer a certain theme. For example a blue and gold theme, maybe a vintage holiday theme, even a whimsical theme for Christmas. That when it works great to match the cat throw pillow to your theme. Luckily, your options are almost unlimited. 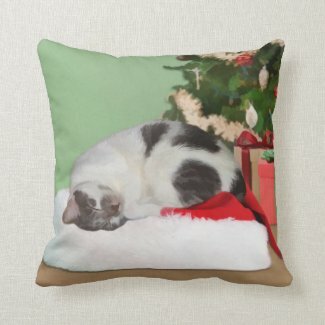 Many of the the talents artists at Zazzle are cat lovers as well. They have created a wide range of charming, beautiful and funny throw pillows for Christmas. I’ve only selected a few of my favorites to feature here, but there are so many more to choose from. You can choose polyester or cotton in several different sizes, including a lumbar style. 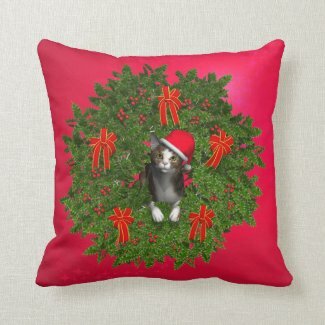 I doubt I could ever run out of choices when I look through the Christmas cat pillows at Zazzle. The pillows make great gifts as well for all the cat lovers on your list. And be sure to check out the cat lovers wrap scarves for more gift ideas. All of my children have their own homes now, and all have cats, some more than others. Cat pillows would be a fun thing to include in their Christmas boxes this year, And I think, from the selection you featured here, I could find pillows that have cats that look like my kids’ cats! These cat pillows are all so adorable! I feel certain my daughter would love them too. I love the one with the cats staring at the nutcracker. That is such an awesome image.